The allure of the wilds of Australia are powerful for many people. In fact, according to Workpermit.com, Australia is one of the most popular immigration countries for young people. With this in mind, Australia offers a variety of different work visas and immigration opportunities for individuals who wish to work and live in Australia- either for a short time or a lifelong career. Australia offers four main immigration paths for healthy adults from other countries, including the Untied States, China, Japan, Germany, United Kingdom, and many other countries around the world. The skilled migration program is designed to attract various skilled workers to the Australian economy. The goal of the program is to ensure that Australia has all of the skilled workers it needs to function in a variety of industries. Healthy adults under the age of 45 who have experience in a skilled trade, such as construction manager, child care worker, veterinarian, doctor, teacher, programmer, and a variety of others. As of 2012, individuals interested in the Skilled Migrant Selection program must fill out an Expression of Interest form. The Australian government will then reply to the application based on their current needs. Business investors can also obtain the Business Skills Migration visa, which allows business investors to start new businesses in Australia or invest in Australian companies. One way to experience short-term work is Australia is through the application for a working holiday. This program allows visitors to work short-term in Australia to experience the culture and what real life in Australia is like. Individuals interested in the program can fill out an application for a temporary 12-month holiday pass. This program is meant to provide visitors with a way to support themselves while on holiday, and is only available for short periods and cannot be transferred into other visas. A fourth working visa option in Australia is the regional living visa. This visa allows citizens from other countries to work and live in Australia in specific regions of the country. To get this visa, you must also have another work visa for Australia, such as the Skilled Migration visa. The regional living visa allows someone to live in a specific region on a permanent basis. 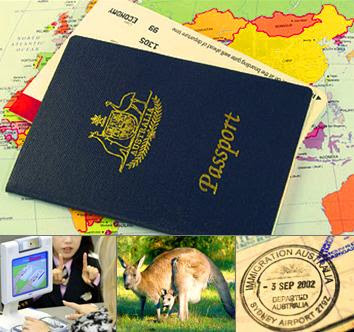 Students wishing to study in Australia can apply for a student visa. A student visa allows someone from another country to attend school in Australia. Usually, the program only allows for students to attend school. If the student also wants to work while in Australia, he or she will have to obtain a second visa for that. In some cases, Australia offers government funded courses for certain degree programs and courses taken in Australia. These classes are available for native Australians and to some students from other countries. These four visas allow a variety of people to work and live in Australia. Australia is a wonderful country full of a variety of landscapes, people and opportunities. Obtaining a working visa is one of the best ways to experience the full splendor of the country as a non-native. Kate Simmons is a fresh graduate and freelance journalist. She has travelled Australia working and enjoyed every minute of it.